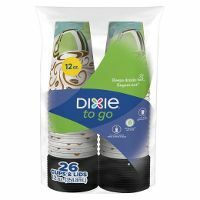 Dixie To Go cups + lids are reliably designed with a leak-resistant Snap-On lid, so you won’t have to hide that coffee stain on your khakis all day. Each cup has insulation and non-slip grip to keep drinks hot, fingers not! They're also coffee-maker friendly, so they fits in most single-serve coffee brewers. Plus, insulated Dixie To Go cups can keep cold beverages cold, not just hot beverages hot.